http://newiprogressive.com/images/stories/S5/caw-election18-demo-s5.jpg Citizen Action members help set agenda for health care, and show growing grassroots power, making tens of thousands of door knocks and phone calls. 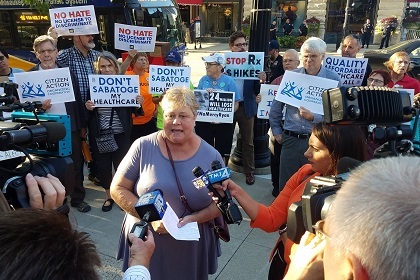 STATEWIDE - Years of grassroots organizing by Citizen Action of Wisconsin members across the state helped build healthcare into the dominant issue in the 2018 elections. The election results create a mandate for Governor Evers to pursue Medicaid Expansion, a BadgerCare Public Option, Long Term Care Reform, and meaningful action on runaway prescription drug prices. Citizen Action of Wisconsin members have been working to inject health care into Wisconsin elections for over a decade, and started campaigning on the dominant wedge issue of pre-existing conditions discrimination in the 2012 election cycle, and every election cycle moving forward. Exit polling makes clear that health care played a dominant role in the historically close election of Tony Evers as Governor and Citizen Action Board Member Mandala Barnes as Lt. Governor, and in the resounding re-election of U.S. Senator Tammy Baldwin. The exit polling shows that a super majority of voters made health care their top issue (by a 26% margin over the 2nd issue) and want “major changes” in the health care system (67% of voters). These striking numbers establish a clear mandate that goes well beyond simply repudiating the policies of Governor Scott Walker. Health care also played a major role in electing Citizen Action Organizer Jeff Smith to the State Senate in Western Wisconsin, and Attorney General Elect Josh Kaul. It also created a blue voting surge which helped elect Citizen Action member Sarah Godlewski as State Treasurer. 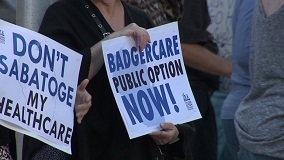 Citizen Action members played a major role in developing the major proactive reform proposal supported by Evers and Barnes, and by most Democratic legislative candidates, the BadgerCare Public Option. The popular reform would take a significant step towards Medicare for All by allowing individuals and small businesses to buy-into Wisconsin’s popular Medicaid program at much lower cost than corporate health insurance (up to $24,000 less for a family of four according to Citizen Action research). Citizen Action members also encouraged Tony Evers in his development of a robust proposal to take on prescription drug price gouging. In the 2018 election, Citizen Action also continued to build its grassroots electoral muscle through its revolutionary organizing co-op model which has distributed our volunteer capacity across urban, suburban, and rural Wisconsin. Volunteer contacts from people who actually live in a community are the most persuasive and are the only way to counter the huge advantage right-wing candidates have in raising dirty money and attracting support from billionaire-funded dark money groups. Citizen Action members across Wisconsin volunteered to make tens of thousands of door knocks, phone calls, and text messages to voters in rural, urban, and suburban areas of the state. Another health care issue that Citizen Action of Wisconsin members started injecting into the election discussion this cycle is the growing shortage of caregivers who provide in-home support to help seniors and people with disabilities live independent lives. Because of Citizen Action’s efforts, paying caregivers a living wage to address the shortage became an issue in Citizen Action Organizer Jeff Smith’s victory in SD 31, and Citizen Action member Julie Henszy’s close loss in the Milwaukee suburbs in SD 5. This could became a major issue in the next state budget. Finally, Citizen Action of Wisconsin’s legal strategy paid dividends in the election result. Citizen Action of Wisconsin’s charitable arm, Citizen Action of Wisconsin Education Fund, joined One Wisconsin Now Institute in a successful lawsuit that overturned Governor Walker’s restrictions on early voting. (Attorney General Elect Josh Kaul was one of our attorneys in the suit). That victory became very significant early Wednesday morning when early votes in the City of Milwaukee put Tony Evers and Mandala Barnes over the top.